April 2, 2012 - Bennett Croswell, president of Pratt & Whitney’s Military Engines division, and Maureen Dougherty, Boeing vice president and program manager, KC-46 Tanker Program, hosted a ceremonial engine contract signing event at Boeing’s Tanker Program Office in Mukilteo, Wash., for contracts previously awarded to Pratt & Whitney. The contracts support PW4062 engine purchases to power Boeing’s KC-46, the U.S. Air Force’s new airlift tanker. The Boeing KC-46 is a military aerial refueling and strategic transport aircraft developed by Boeing from its 767 jet airliner. 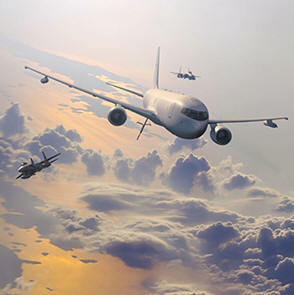 In February 2011, the tanker was selected by United States Air Force (USAF) as the winner in the KC-X tanker competition to replace older KC-135 Stratotankers. Two Pratt & Whitney PW4062 engines, each with a 94-inch fan blade diameter, will exclusively power each U.S. Air Force KC-46 aircraft. The program’s scope, if fully exercised, calls for as many as 368 PW4062 engines to be delivered between 2013 and 2027. Actual production engine procurement quantities will be determined over the life of the program as established by future purchase orders. Pratt & Whitney has delivered more than 2,500 PW4000-94” engines that have collectively logged nearly 110 million flight hours on commercial aircraft around the world. The PW4062 is the highest thrust model in Pratt & Whitney’s PW4000-94” commercial engine family and is offered for both commercial freighter and military tanker applications. The two PW4062 engines that will power the KC-46 each deliver 62,000 pounds of thrust. The PW4000 engine family has an outstanding safety record, high reliability, excellent performance and low maintenance costs. The PW4000-94” family meets emissions and noise regulations, and offers superior fuel economy and maintainability. The PW4000-94” engine operates commercially on the Boeing 767, MD-11 and earlier Boeing 747 models. Pratt & Whitney is a world leader in the design, manufacture and service of aircraft engines, space propulsion systems and industrial gas turbines. United Technologies, based in Hartford, Conn., is a diversified company providing high technology products and services to the global aerospace and building industries.